Google Maps is a wonderful tool you can use right at your computer to revisit your childhood home and neighborhood when you want to remember those nostalgic times and wistful memories of long-gone moments of home and family that now seem like better or simpler times. 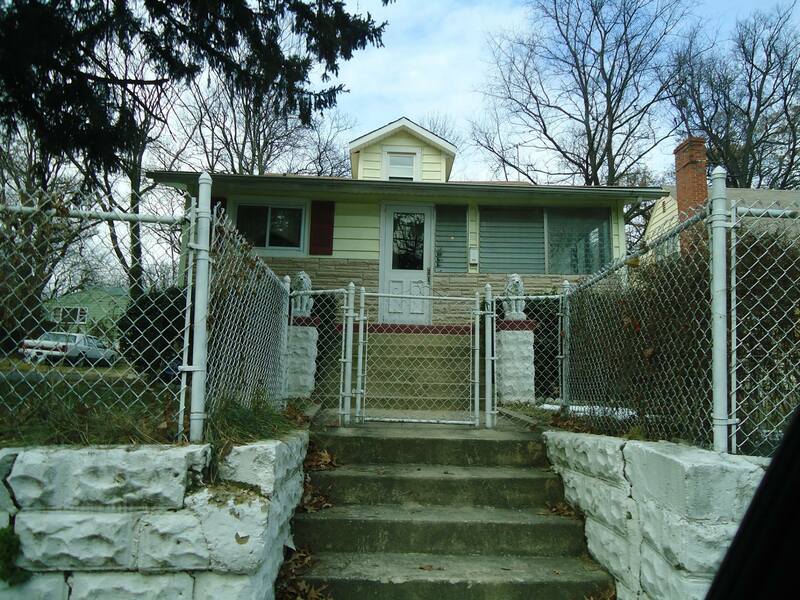 The picture on the right was my parents two-bedroom, one bath, cape cod home in Capitol Heights, Maryland. This is the home they brought me to as a newborn, directly from the Old Sibley Hospital in Washington, DC. 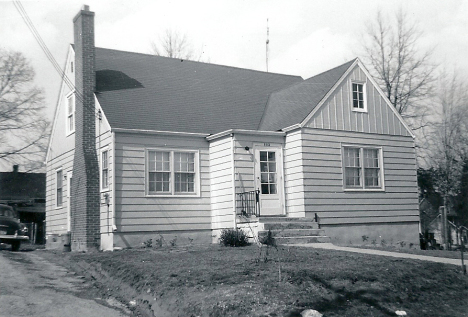 Mom and dad had contracted to have this house built in 1946 and this is how it looked 12 years later in 1958 before we moved to District Heights. A lot has changed in this neighborhood–like so many others–including the street names and house numbers. The original exterior was finished off in asbestos siding and roof shingles. It was probably about 1956 when my parents had the asbestos siding covered over with the “in-material of the day”–aluminum siding. Mom passed away recently due to long-term and severe COPD. The doctors would always ask her how she thought she might have been exposed to chemicals that harmed her lungs. Most of us know that lung disease issues can be attributed to unknowingly long-term exposure and inhalation of airborne asbestos fibers into our lungs. We’ll never know for sure if mom’s lung disease was related to the asbestos, her short-term smoking history as a young adult, or years of breathing others second-hand smoke. But, hopefully, our younger generations will avoid the years of breathlessness and being shackled to oxygen-providing machines. The walls in our living room and dining room were covered in flowery (but tasteful for the day) wallpaper, hung by mom’s friend, Tootie’s, aunt. There was a very short hallway between my parents’ front bedroom, the bathroom, and my room at the back end. Within this hallway was a “telephone stand.” You know, the upholstered one-seater with a side desk for the desk-sized rotary dial phone and a shelf under the desktop for the big old phone books. And, remember, we had no private lines, and when they private lines were made available to you, you would have to pay a premium to have them. So, we had what was known as a party-line which meant we shared our telephone lines with one or more families and each of us had to pick up the receiver to check whether other party line members were using the line before we could get a dial tone to place our calls. (Some privacy, huh?) I remember mama had her daily list of callers: both of my dad’s sisters, her mom, her cousin, Frances, and her friend, Tootie, who lived in District Heights. I believe each member of the party-line had a specific ring to let them know the incoming call was intended for them. I guess this would be the equivalent of today’s texting or social media phenomena. There used to be a saying in our family. There are three forms of communication in our family: “Telephone, telegraph, or tell grandma,” to be sure everyone was “in the know,” about any given event or topic. And, families were stay-at-home families during the weekdays. Get-togethers were primarily held on Friday nights, Saturdays, and Sundays after church. Weekdays were for work and school studies. Before families split to go their separate ways in the mornings, they would say goodbye to each other and be sure they communicated everything necessary about the remainder of the day until they rejoined each other in the evening. Remember, there were no cell phones and there was no sense of immediacy to disrupt work or school schedules. We would talk next with updates as a family over the dinner table. Like most other women in the 1950’s Mom was a stay-at-home mom and very much into seasonally dressing and redecorating the interior and keeping it sparkling clean. Very few homes had air conditioning in the 1950’s. Our attic was unfinished. The temperature would get into the 100’s up there on hot days. We slept with the doors and windows open in the summer and doors and windows protected from the cold in the winter. We had hardwood floors that got cleaned and waxed each quarter. Much of the floor was protected and hidden by large area rugs (woven rope for the summer and heavy pile wool rugs for the winter). The same went for the drapes and curtains. Heavy in the winter, light in the summer. Both bedrooms had noisy window fans in them in the summer. The imposing fireplace in the living room was seldom used. Mostly, I believe dad hadn’t yet learned how to build and keep a fire going. And, mom, obsessed over the smoke and dirt involved in using it. But, I loved the ambiance of a fireplace and its hearth. I remember just as vividly, our living room furniture. The couch was maroon and the matching chair was a deep blue–both were upholstered in rich velvet. The step end tables and coffee table were a rich mahogany wood like the dining room set. The tables in the living room had raised beveled edges surrounding the tops, like the tops of pie crust. Our lamps were also that deep maroon base with painted formal-clad couples dancing around the middle. Their shades were white with matching rich maroon ruffles around their tops and bases. The mahogany dining room set that I mentioned still stands and is in near perfect condition in the dining room of their home of 60 years now. Ours, like many basements of the 1950’s was fully finished using genuine knotty-pine wood planks. We had a ping-pong table and pinball machine. How grand it would have been to also have a Wurlitzer jukebox. By the time, my parents had managed to have a second phone installed in the basement. I distinctly recall a thunderstorm on one summer’s day, where my dad answered the phone just as a clash of lightning and thunder struck the line outside and traveled through the telephone line. He received a mighty jolt that knocked him to the floor right there in our rec room. After the fright, we all had a hardy laugh and learned not to answer the phone during electrical storms. My paternal grandfather, Jesse, lived with us for several years before we moved to our new home. His bed was also downstairs in the rec room area. Just outside the rec room area was the laundry room. There, we had an old-time wringer washing machine. And mom taught me young how to help out around the house with the chores. One day, I was transferring the clothes from the rinse water in the tub and guiding them through the wringer into the laundry basket to be hung outside to dry. I’m not sure how, but I managed to entangle my hand and arm into the clothes and on into the wringer. Luckily mom was nearby to turn off the machine and untangle me from the arm-eating machine. Just next door stood the home of my uncle Johnny and his family, and adjacent to them were my maternal grandparents, Roy and Loretta Ford. Here’s the now 82-year-old former Ford residence as it looked in 2014 when we drove past it just out of curiosity one day. Note the vintage “rock face” block the was used to make the front columns and the front yard’s retainer wall. These hand mixed and pressed blocks were popular in the late 1890’s through the1930’s. (This residence was built in 193 6.) I should tell you that Loretta lived in this house with Roy during the 1940’s and returned there after Roy’s death as a renter in the mid-to-late 1950’s. 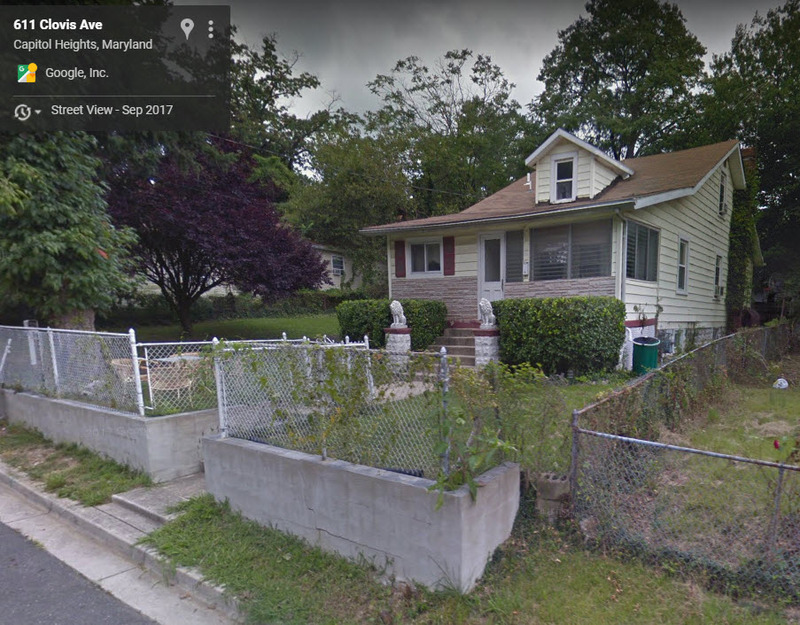 Roy and Loretta relocated to Glendale, MD before we moved to District Heights. Uncle Johnny and Roy were starting up a dairy farm in Elmira, New York, but unfortunately, Roy passed away in the midst of the transition from Glendale to Elmira. Grandma Loretta went to live with Uncle Johnny who moved back to Maryland. After meeting a friend through the American Legion, my grandmother regained the property at Capitol Heights and she and her friend upgraded and refinished it throughout. Unlike this picture shows, her front porch was screened in, which she did herself with my help. It was the more recent owners who enclosed the porch. And, instead of concrete lions atop the columns, Loretta had giant begonias of burgundy and yellow in large vases. And there was a rose trellis filled with pink roses at the front gate. Along the side fence between the two houses, snow on the mountain and honeysuckle bushes thrived. Meanwhile, sometime in 2017 Google updated its maps and pictures of this area. While the original columns still remain intact, it appears that the cracking retainer wall was repaired or replaced and now you see only a bare flat concrete wall. In the backyard was a near life-size playhouse where my girlfriend, Georgeanne, and I spent many hours playing with our dolls and decorating the inside. To the left of this picture was also an overgrown side lot adjacent to the driveway. By this time, my grandmother, Loretta, had had several heart attacks and I volunteered to help her clear the lot and cut the “lawn.” Well, the lot had been used by my girlfriend’s dad (a former owner) as a car repair area. So, on this sunny and hot day with the grass wildly overgrown, I set out barefoot, as I usually did, to cut down the overgrowth. Grandma had an old-fashioned push mower with the spiral blade that turned based on the operator’s strength and speed but my small and skinny body was getting nowhere fast. So, I went home and retrieved my dad’s newer gas-powered mower. This guy was really doing the job despite me having to push down on the handle to lift up the bottom so the blades were above the tall grass so the engine would not choke and stall out. Then it happened. I felt what I thought was a big hit the top of my foot that apparently had been thrown out from under the mower. I looked down and freaked out. An old and rusty heavy duty wire that was about 1/4″ in diameter had deeply impaled my foot and was sticking out the top. It felt like it went straight through my bone and I couldn’t walk on it. Both mom and grandma who had been watching my progress came to my aid. Grandma went in and retrieved the pliers. Each tried to pull out the wire, but it wasn’t budging. So finally, pulling each other and the pliers together, they were able to remove the embedded wire. Then it was off to Prince George’s Hospital in Cheverly, Maryland, where I was x-rayed and received a tetanus shot. My Uncle Johnny’s former home (in the middle) seems to have fallen on hard times. Although I do note that curbs have been installed since we lived on this street. Our former home is at the far right of this picture. I see that the owners were able to grow a tree in the front yard. My mom tried to grow anything and everything, but nothing seemed to live very long. Well, there was one bush. It was a periwinkle blue-purple hydrangea and you just couldn’t kill that thing. Sometime over the past 60 years, the street has been smooth-surfaced. When I was about 10 years old, I used to walk up and down the then rough and hilly street on handmade stilts or while spinning a hula-hoop around my hips. I remember one day I had a hula-hoop marathon and managed 10,000 spins before quitting when dark started setting in. This must have been some kind of Guinness Book record. Unfortunately, my grandmother and mother were my only witnesses and both have since passed on. As I sit here remembering, I realize that there are many more stories from times past that I could share–and maybe another day I will. Thank you, readers, for indulging me on another trip down my memory lane. 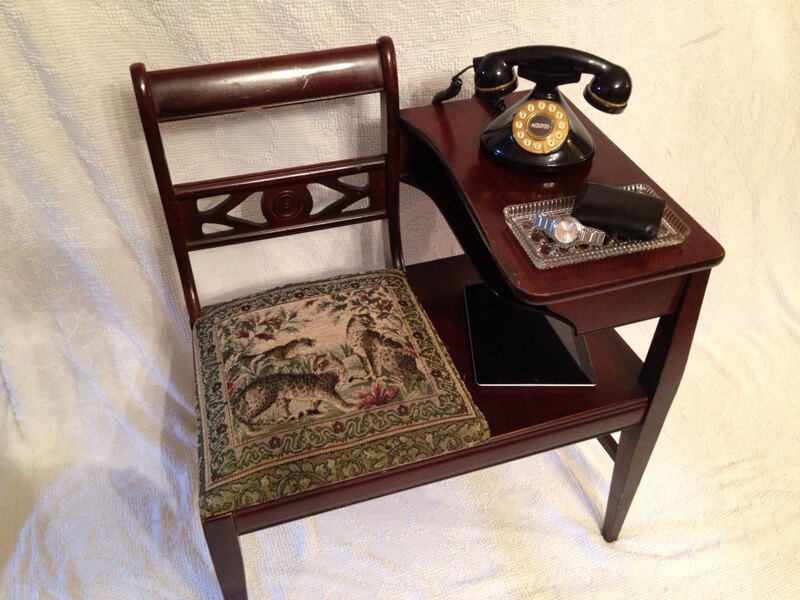 We even had a phone stand just like you showed in the photo and I remember our phone number starting with Redwood or RE and Im sure a number of your readers remember that. Thanks Lonnie for your conment. Yes, we had the Redwood and RE exchange. In fact, my dad’s phone number has been the same for 60 years! Really awesome details and photos! I remember a lot of what you have mentioned.